For the Belarusian scientist, see Anatoliy Nikolaevich Serdyukov. 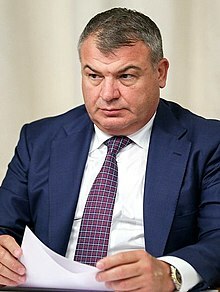 Anatoliy Eduardovich Serdyukov (Russian: Анатолий Эдуардович Сердюкóв; born 8 January 1962) is a Russian politician and businessman who was the Minister of Defense of Russia from 15 February 2007 to 6 November 2012. During his tenure as defense minister, he launched several major reforms of the Russian military. Since October 2015 he works as an Industrial Director for Rostec State corporation. Born at Krasnodar Krai on 8 January 1962, Serdyukov graduated from Leningrad Institute of Soviet Trade in 1984 with a degree in economics. From 1984 to 1985 he served in the Soviet Army. Since 1985 he had worked in a furniture shop and from 1995 to 2000 was the director general of Furniture Market, a furniture company in Saint Petersburg. Serdyukov's career started to develop very successfully after the election of Vladimir Putin as Russian President in 2000. In 2001, Serdyukov graduated from the Law Department of Saint Petersburg State University. From 2000 to 2001 Serdyukov served as deputy chief of the Saint Petersburg Directorate of the Tax Ministry of Russia. From 2001 to 2004 he led the directorate, succeeding Viktor Zubkov, his father-in-law. On 2 March 2004, he was appointed deputy tax minister of Russia. From 2004 to 2007 he led the tax ministry (in July 2004 reorganized into the Federal Tax Service of Russia). During this period, the key officials of the service were replaced mainly by Serdyukov's colleagues from Saint Petersburg. He also often resorted to personnel rotation and appointment of former federal tax officials to the regional tax service departments in the federal subjects of Russia. During his tenure, court decisions in favor of the federal tax service became much more common. While the service was formally subordinate to the finance ministry under Alexey Kudrin, in fact Serdyukov very much leaned towards Presidential aide Viktor Ivanov. On 15 February 2007, President Vladimir Putin appointed Serdyukov as Defense Minister of the Russian Federation, with the main task of fighting corruption and inefficiency in the Russian armed forces. On 14 September 2007 Serdyukov offered his resignation to the president over family relations with Viktor Zubkov, but this resignation was not accepted. According to Russian newspapers Serdyukov received the honorable title of Hero of Russia by a March 2012 secret order of President Dmitry Medvedev. Serdkuyov was sacked by Putin on 6 November 2012 and replaced by Sergei Shoigu. In November 2013 Serdkuyov was charged by Russian investigators with "negligence" for ordering the army to build a road from a village to a private country residence in Russia's south. He was amnestied in 2014 by a presidential decree. In October 2015 he was appointed as an Industrial Director of Rostec State Corporation. His duties include supervising of all the company's aviation-related activities from helicopter-building to airplane engines. In office, Serdyukov chose not to get involved in the daily administration of troops and operational-strategic planning, leaving these matters to the professionals. Instead, he focused on organizational and budgetary issues, in which he, according to Moscow Defense Brief, "insisted upon an unprecedented (at least for the MoD) level of precision and fastidiousness." This reportedly enabled him to quickly "put the generals in their place," and "to instill a level of background fear that even the old-timers do not recall having seen before." According to an anecdote, an officer in one of the central directorates of the MoD explained: "senior generals go to meetings of the Defense Board as to the scaffold." According to Moscow Defense Brief, Serdyukov’s first year in office was marked by convulsions, "the likes of which have not been seen on the Arbat in decades." The magazine pointed out, that "Serdyukov brought apparently unlimited energy to a thorough purge of the department." He fired almost a third of the top officers of the Central Military Administration and initiated a sea of change in the Ministry of Defense. During his time in office, Serdyukov has launched several wide-reaching reforms. The main idea behind his reforms was the transformation from a mass mobilization army to a small force of contract soldiers. In 2010, Serdyukov launched a $430 billion military reform to be achieved over the next 15 years in order to fully re-equip Russian conventional forces. Serdyukov also launched plans to reduce the personnel in the central administration by 30%, which would lead to the liquidation of a significant number of positions filled by generals and colonels. He was demanding drastic cuts in Russia's officer corps. There was an officer to every two and a half men. After the reform there should be just one to every 15, more similar to western armies. The reform would mean losing 200,000 jobs, and has been met with fierce political opposition by the "old guard." Because of the pressure, the deadline for implementing the cuts was put back from 2012 to 2016. Army divisions were disbanded and replaced by brigades. The six military districts of Russia were replaced by 4 geographic commands. Addressing acute and long-standing issues such as the ineffectiveness of Russia’s defense industrial and procurement policies was also one of Serdyukov's chief aims. The questions addressed included: "why, with so much spending on defense, do the Armed Forces possess so little new equipment? Why does the design and testing of many new types of armament take decades to show results?" Serdyukov initiated modifications to the Russian military uniform and addressed the issue of the physical condition of Russia’s generals and senior officers: the entire service personnel of the General Staff, irrespective of rank, must now meet set physical standards upon threat of dismissal. He also called for mergers of Military academies, sharp cuts in the number of military bases, and reductions in rear support and noncombat units. Many of Serdyukov's reforms and anti-corruption measures were met with open opposition and led to many dismissals. His actions, however, gave him a positive image in the eyes of the Russian public. Severe disagreements were reported in late 2007 and early 2008 between Serdyukov and General of the Army Yuri Baluyevsky, Chief of the General Staff, most recently over the Minister's proposed move of the Russian Navy Main Staff from Moscow to Saint Petersburg. Later, this was proved by following Baluyevsky's resignation. Serdyukov is married to a daughter of Viktor Zubkov, the 10th Prime Minister of Russia and previous chairman of the Federal Financial Monitoring Service of Russia. ^ a b Yevstifiyev, Dmitry. "Сердюков снова в деле" (29 October 2015). Gazeta.ru. ^ a b "Russia: Biographies, Photos of RF Armed Forces Leadership". Open Source Center. Retrieved 1 April 2013. ^ "Russia's Daily Online". Kommersant. Retrieved 6 November 2012. ^ "New Cabinet to be formed by Friday". RİA Novoski. 18 September 2007. Retrieved 6 November 2012. ^ "СМИ сообщили о присвоении Сердюкову звания Героя России". Lenta.ru. 10 February 2014. ^ Mukhin, Vladimir (10 February 2014). "КАРТ-БЛАНШ. Анатолию Сердюкову присвоили звание Героя России. Еще в марте 2012". Nezavisimaya Gazeta. ^ "Russian Defence Minister Anatoly Serdyukov fired by Putin". BBC. 6 November 2012. Retrieved 27 March 2013. ^ Kramer, Andrew E. (29 November 2013). "Russian investigators charge ex-Putin ally". The Age. Retrieved 29 November 2013. ^ "Son of Russian Minister Sacked in Land Sale Scandal Owns Privatized Land – Report". The Moscov Times. 23 March 2015. Retrieved 8 April 2015. ^ a b c d e f g h Ruslan, Pukhov (2009). "Serdyukov Cleans Up the Arbat". Moscow Defense Brief. Centre for Analysis of Strategies and Technologies (#1 (15) / 2009). Retrieved 19 May 2009. ^ a b c Barabanov, Mikhail (16 February 2009). "The Army's Chief Destroyer". The Moscow Times. Retrieved 19 May 2009. ^ Aris, Ben (2 July 2010). "Kremlin pushes ahead with army reform". The Telegraph. Retrieved 13 July 2013. ^ a b Whewell, Tim (17 March 2009). "Inside Russia - Military reforms". BBC News. Retrieved 19 May 2009. Wikimedia Commons has media related to Anatoliy Eduardovich Serdyukov. Civilian Economist Heads Defense Ministry by Dmitry Butrin, Vadim Visloguzov and Maxim Shishkin, Kommersant, 16 February 2007. This page was last edited on 18 January 2019, at 07:34 (UTC).